Contributing writer Rachel Cericola recently posted a story on Electronic House magazine’s website about how “Hammacher Schlemmer Wants to Sell You Some Home Automation.” Of course, the story perked our interest since this is another example of “home automation breaking into the mainstream,” as Cericola points out in her lead paragraph. After reading her story and reviewing the listing on the Hammacher Schlemmer website, however, we’ve seen that Hammacher Schlemmer entrance into the home automation market is nothing new. We’re not impressed, Hammacher Schlemmer. Home Controls has been distributing smart home technology since 1989. We know home automation. 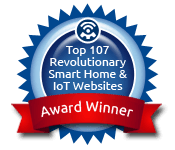 When we saw the one – and only one – home automation product on the Hammacher Schlemmer website, we immediately recognized it as a SkylinkHome system. A source at Skylink has confirmed this fact, saying “they are marketing the product package without our brand. However, when the customer orders and receives the package, SkylinkHome is everywhere.” It’s interesting to see Hammacher Schlemmer has conveniently removed all the SkylinkHome logos from their photos. Home Controls knows the Skylink Home Control system, since we are an authorized distributor of the popular DIY automation system. It’s a solid product line, one that Home Controls is proud to offer. In comparison, however, we offer their entire product line – not just one kit with four devices. At Home Controls, customers can choose from more than a dozen kits and more than 40 SkylinkHome products; that’s their entire collection. Plus, our prices are lower than the $149.95 kit being sold at Hammacher Schlemmer. Considerably lower. There isn’t anything mainstream about the Hammacher Schlemmer listing, and they are certainly not breaking into home automation. If you are looking to add home automation to your home, then shop at Home Controls. We know home automation – and we certainly know not to list our SkylinkHome products in telephone accessories!